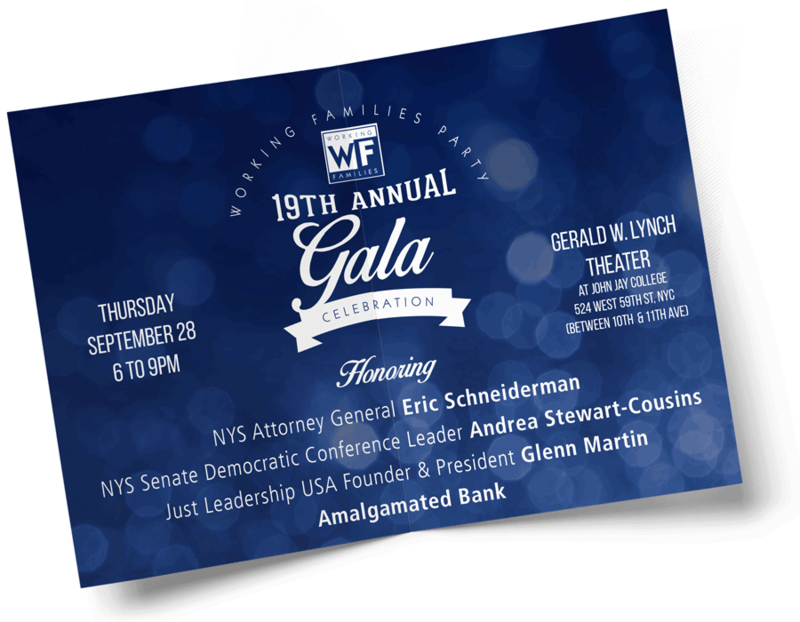 On Thursday, September 28th, the Working Families Party will be celebrating our 19th birthday in New York. And we’d love for you to celebrate with us. This year, we’re proud to be honoring progressive champions who are helping to make New York a national leader in the resistance against Trump and working to build a state that works for all of us, including New York State Attorney General Eric Schneiderman, New York State Senate Democratic Leader Andrea Stewart-Cousins, Just Leadership USA Founder and President Glenn Martin, and Amalgamated Bank. Or become a WFP sustainer with a monthly contribution of $10 or more and receive an Activist Rate ticket to our 19th Annual Gala Celebration on September 28th in NYC.